Just as some people were thinking that the leaving of the Orizzonte Malawi volunteers back to Italy this Sunday is the end of the operation of the new acquired excavator, Bertin Kamanga thinks the opposite. “I have learnt from these volunteers how to operate this machine and I will take up the challenge,” says the soft spoken Kamanga who also heads the Mechanic Section of Andiamo Youth Cooperative Trust. Asked how he is going to manage the excavator and the garage, Kamanga says that like the volunteers he will also identify an individual who must learn how to operate the excavator “so that every time I am busy he should be working”. The excavator has proved to be a great asset to AYCT. In one week alone that the Orizzonte Malawi volunteers have been in Malawi, they have managed to dig a pit latrine, that could normally take weeks to complete, that once completed will be used by students of Andiamo Education Institutions (AEI) . The volunteers, with the help of the excavator. have also cleared and filled up a road that will help the movement of some of the workers and Andiamo and kids that learn at St Augustine Primary School. 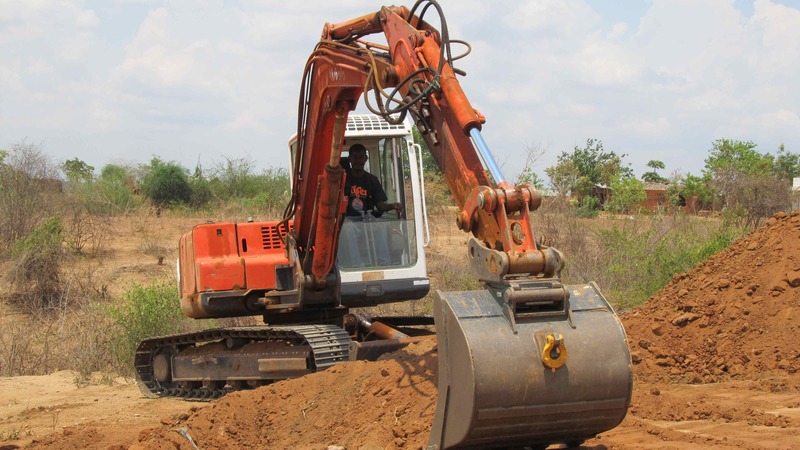 During this short stay here, the excavator has worked on the drainage system of the road connecting St. Louis Montfort Parish and Andiamo through Montfort Media. This entry was posted in News from Malawi, Social Development and tagged AEI. Andiamo Education Institutions, Andiamo Youth Cooperative Trust, Orizzonte Malawi. Bookmark the permalink.